It’s not often that I encounter other Margarets out in the world. Or Margarets who only ever go by Margaret, not Maggie, or Meg or any of the other nicknames that I can not abide. When I do, they are usually part of AARP set. Which suits me fine because I tend to share a lot of common interests with the ladies of that age: needlepoint, soup, knitting, dollhouses, early bedtime. Using outdated phrases like razzmatazz, and shenanigans. But today the other Margaret I spoke with divulged her special interest- bangles!! She apparently owns a big collection. And I thought “Woh!” because I was very impressed by this chic lady. I wish I had asked to take a picture of her wrist but I was too shy. So you get more of the same, my wrist. Plus my hand with some notes on it, maybe even including the word hand. 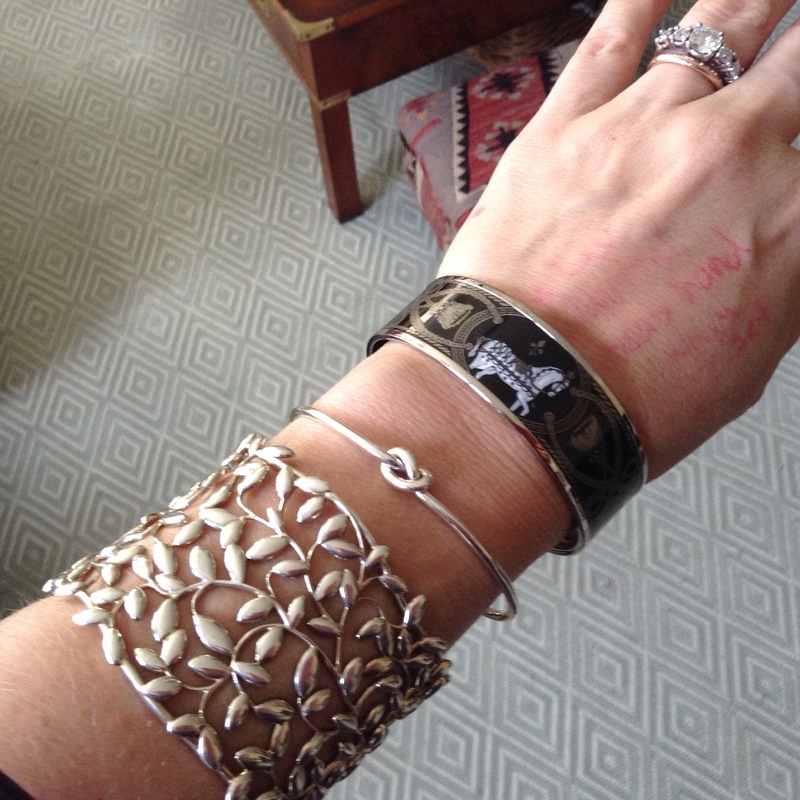 Today’s bangles are the posthumous birthday gift bangle from my dad, the Elsa Peretti vine cuff also from my dad, and my brand new knot cuff. Funny, my Margaret’s are a Maggie and a Meg.Margaret is a pretty name, it reminds me of fine lace or something. It’s an underused name. I’m in the old lady club, I don’t know if you feel this qualifies but the only Susan’s I ever meet are babyboomers and beyond. Excellent bracelet situation today & it’s cool you found a fellow bangle lover name Margaret too. Welcome to the club! Have you been to the link on the social security website that allows you to see the peak popularity if your name? Mine was like 1938. Are you always Susan? Or do you have nicknames? Thank you so much, I’ll represent the club properly. I’m always Susan even when I introduce myself people will say “Nice to meet you Sue”, it’s like back it up who is sue? & I did not know about the ss site ranking names! I just looked & Susan, out of 150 years, was #2 in the late ’50s and 1960. Haha! That is exactly how I feel when people try to call me one of the Margaret nicknames so I have a lot of respect for never presuming a shortened name. I think there’s a Neko Case song with both our names in it, actually. I’m looking it up! Shoot, I confused Neko Case for Hope Sandoval, and her song isn’t even Susan, it’s Suzanne which I bet is just a strange and removed as Sue. Marvelous! What did you find? I love the middle one the best. A simple design with a knot. There’s a lot more to it than that, but it’s great, nonetheless. And–I’m still trying to figure out what’s written on the back of your hand! Haha! It’s soaps 🙂 S. Seas hand wash. I sell soaps, and needed to remember a special order. 🙂 I really should have! This is the second time I’ve met someone and not had the guys to photo their bangles. I need to figure out how to broach the subject.